Welcome to "spring" in New England! Usually at this point in April, I have pulled out my spring/summer clothes, we can go outside without a jacket, and the riding is plentiful and usually warm. Not this year. It seems that we are now paying for the late start to our winter (and 70 degree temps in January), with more SNOW on the way this week. 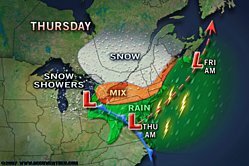 Depending on the forecast, we are supposed to receive anywhere from 1 - 6 inches of snow tomorrow in MA, with northern VT, NH and ME getting the brunt of this late storm. As much as I love the winter, ENOUGH ALREADY! One of the rides Mike and I did this past weekend was a fairly mellow mountain bike spin on some local trails. We didn't catch a glimpse of the Easter bunny (or any Easter chicks), but we did see some ducks that weren't happy to see us. This weather is not helping me ride myself into fitness, now is it?